You know the longest table in the world measured 2,184m (7,165 ft and 4 inches). This massive table was put together by the Ajialouna Organisation in Beirut on June 9th 2017. More than 5,000 people sat at this epic table and enjoyed a rather lovely meal (although I imagine passing the salt might have taken some time). There’s something quite magical about that image of an endless table going on and on into the distance with 5,000 people all sat around it enjoying themselves. Talking, eating and sharing, it holds ideas of community. There’s something about sitting next to someone, by their side in a shared act that is quite special. In 1965 Life Magazine ran a special double issue on the American City. The special celebrated the vibrant cities of that country and explored how they might rise to the major challenges of growth, over populations and societal change which they were facing. The issue saw the mention of a design for a new city submitted by two unknown architects, who purposed a radical new plan. Peter Eisenman and Michael Graves envisioned what was to be known as the “Jersey Corridor” a modernist megastructure, a vast 47 mile long city. Containing every function – workplace, housing, shopping and leisure facilities. The city was a linear design and was to be built along a highway in two parallel bands, one containing apartments and the other workplaces and shops. The corridor would be multi-storey with transport links running underneath the linear city. This would leave vast open spaces for nature and recreation ether side that could stretch far into the distance. The city was of course never built but the idea of a linear community, the idea of living side by side is a concept that repeats in most sociological designs. During the October festival Made in Roath held a special parade with banners made by community groups and organisations. The parade walked through the streets of Roath to celebrate the start of the festival. It was called “By my side, come rain or shine” and was designed to bring Roath together. Its this concept that we see at a meal, where you sit side by side with someone else. With a friend or a stranger, you are sitting for a meal in someones company as they are in yours. 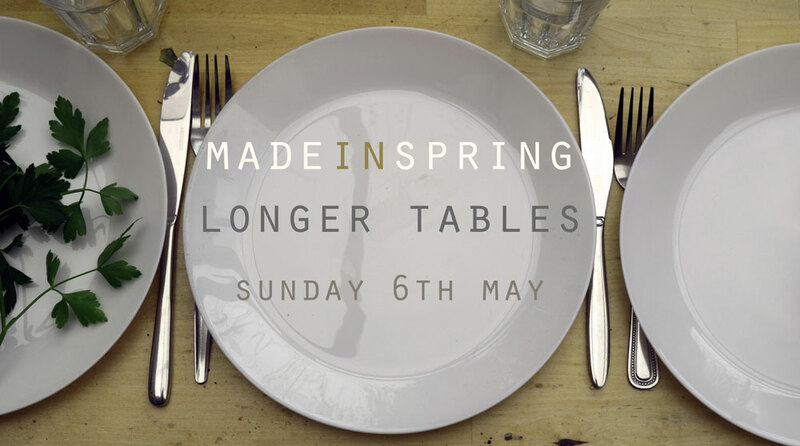 This year for Made in Spring we will be exploring the concept of being by each other side and sharing a meal together with Longer Tables. 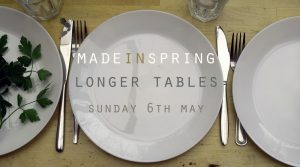 This will be taking place on Sunday the 6th of May. We’ll be closing Plasnewydd road once again and filling the street with a special bespoke table for a community meal. We’ll be sharing food and conversations along the street. We also have artists Tim Bromage, Ellie Young and Hilary Roberts creating new work along the length of the table. It will be a fantastic sight and a lovely experience for anyone who can attend. The whole event is free and open to everyone and it will be taking place from 1-3pm on Sunday the 6th of May. Hope to see you there. madeinroath is a community arts festival based in the heart of Roath, Cardiff. The festival aims to take art out of the gallery and into the community, through an exciting programme of events and activities. madeinroath’s focus is on showcasing the huge creative talent from within the local community, as well as bringing exciting and inspiring art and culture to Roath from further afield. madeinroath would not exist without the support, encouragement and involvement of the people of Roath. If you would like to volunteer, open your house or studio, volunteer a business, community or home space for an event, or contact us with your ideas please email info@madeinroath.com.